Controlled Temperature Of Printing Chamber to Achieve Superior Printing Results. 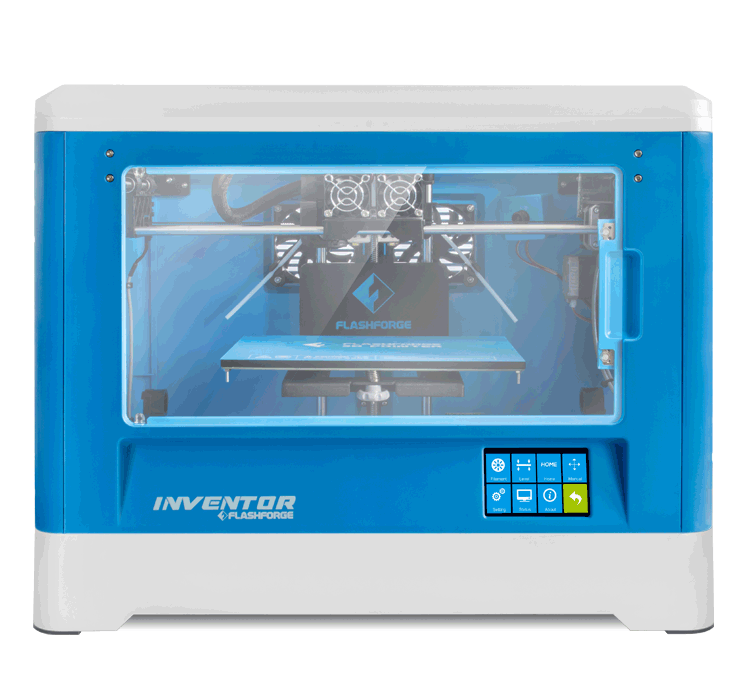 Temperature variations will directly influence the quality of the printed part, especially with complex models.Inventor features a controlled build chamber which maintains a stable print temperature environment and ensures minimal shrinkage of the materials to get a better print effect. The inventor has 5 built in fans and a temperature control measuring chip. 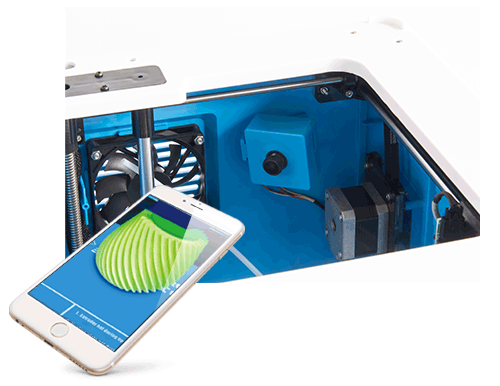 The real-time temperature measurement allows the chamber to maintain a stable environment for 3D printing. ​More succesful and accurate output. Temperature is very important for ABS filament printing. Inventor features a closing door and removable top lid to keep out dust and foreign particles, meanwhile eliminates exterior temperature interference. 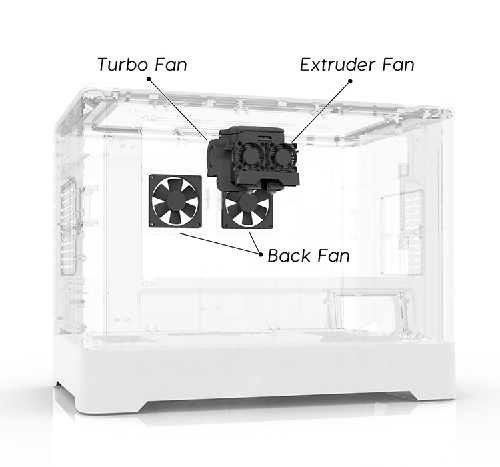 The built-in heat-controlling sensor activates fans automatically to stabilize the printing temperature for high-quality ABS and other exotic material prints. ​Smoother curves on finished prints. 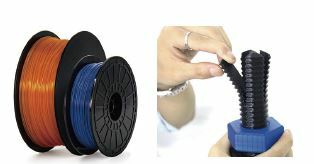 Extruded PLA filament needs to be cooled down quickly to reduce stringing, strands of plastic on places where the 3D printer shouldn't print, and yield out prints with smoother curves. Five cooling fans will be activated automatically when the temperature in the extruders and the chamber reach a certain value. This enables you to end up with superior results from PLA filament. ​but also a wide range of materials. 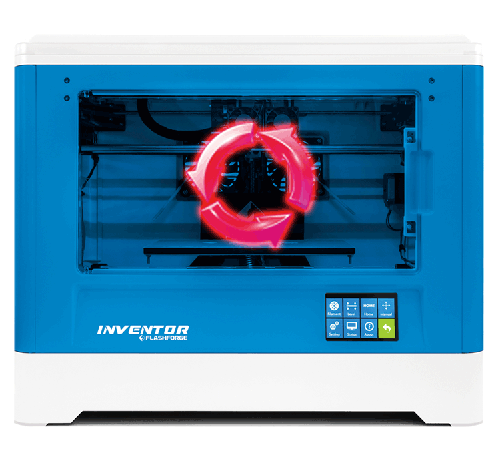 Inventor comes with proprietary duel extruders and it has both insulation and cooling functions. It allows you to print the main part with ABS filament and the support structures with water dis-solvable filament. This gives you solid infill for delicate overhanges and objects with internal moving parts. It can also be tuned to print with a wide range of experimental materials such as Flex and composites materials such as EasyWood and MetalFil. ​Resuming printing from power failure function greatly improves user experience. No more failed prints due to unexpected power outage. Resume printing right after you turn on Inventor 3D printer. ​Live Printing.Observe your model in real time. It's not easy to observe a model which requires 30 hours or more of printing - you won't know how the print is going. Now you can use the built-in camera and the APP to monitor the printing progress when you're away from the printer. 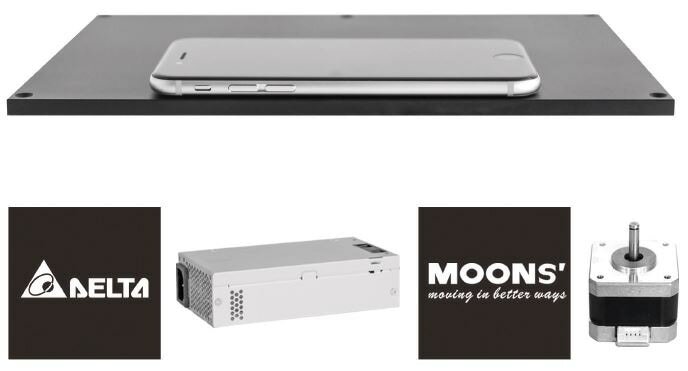 From the outside in, all major parts such as motors and power supplies are from world's top suppliers, and all plastic parts are injection molded. These bring a consistent and stable Inventor 3D Printer. We set rigorous standards for assembly lines, where each machine is tested over 48hrs for top quality. 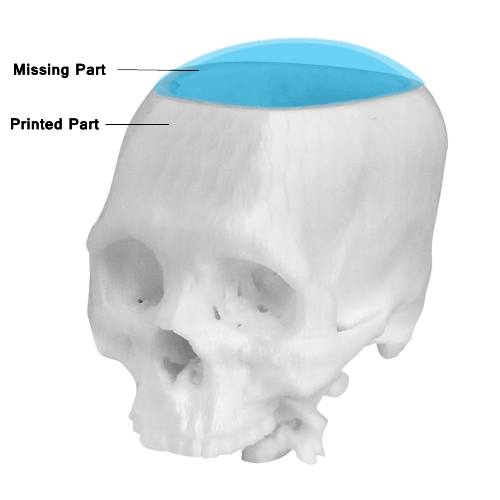 ​The method of printing is constantly simplifying, but the way of modeling is still not easy. 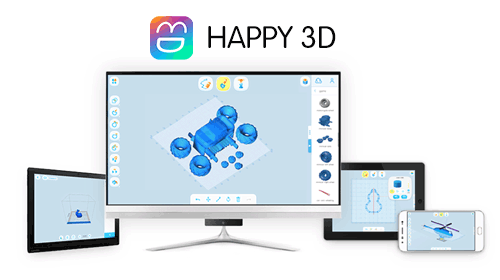 We think from 3D modeling to 3D printing, this should be a pleasant and easy process.Happy 3D allow drawing 2D objects or extending them to 3D. Happy 3D makes people a whole new experience, with more than 100 free 3D models with 7 categories items to creating 3D designs by combining two or more models in just few simple steps. Totally-enclosed Design & Inner Temperature Controlling System. 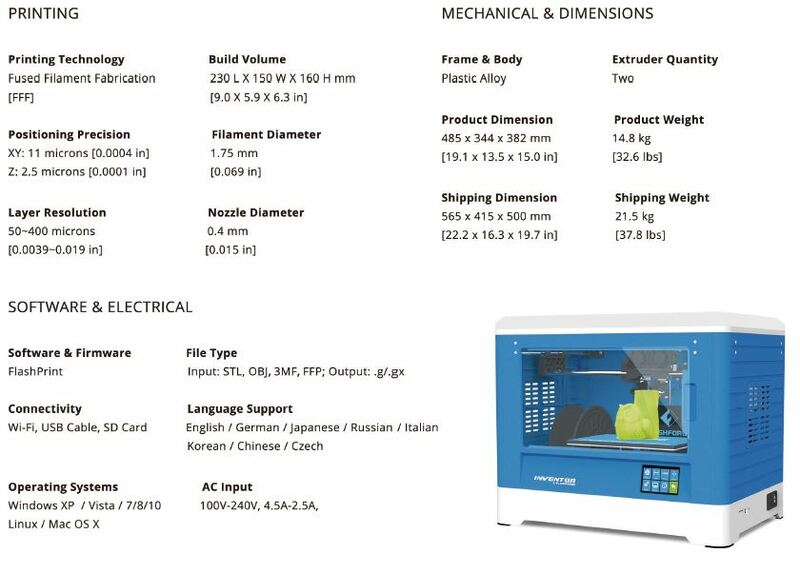 ​Perfectly Meet Temperature Requirements of Different Filaments.